The Cherry MX Red-equipped gaming keyboard gets 30% more enticing. Although it's functionally nonessential, adorning your PC with a smattering of pretty lights is like dressing up your RPG character to resemble Guy Fieri: it's simple, harmless fun and if you don't like it you can leave. That said, buying an RGB keyboard can be expensive, often necessitating that you shell out hundreds of dollars for an expertly engineered combination of metals and plastic. Fortunately, even some of the top mechanical gaming keyboards are discounted by their manufacturers every now and then. The Corsair Strafe RGB MK.2, for example, is on sale right now for $99.99 on Amazon, 30% less than what it normally costs. And if you want to stick it to Jeff Bezos, it's the same price on Newegg as well. Granted, only the model sporting Cherry MX Red key switches is on sale. If you've got silent switches on the mind, you'll still have to pay full price. 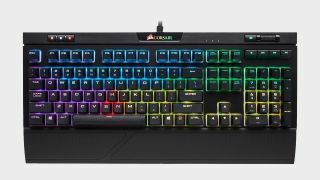 Per-key RGB backlighting comes at a price, and with this primo gaming keyboard, that price is $100... but only if you act fast. We recommend that you do, before it ramps back up to $140. Local computer enthusiast shop Newegg is also running this deal at the moment, so for non Prime-heads, here's your chance to buy somewhere else. Either way, a crucial selling point of this keyboard is that it offers per-key RGB lighting, which is typically found only on high-end premium boards due to the high cost the individual LEDs add to assembly. That ought to pair nicely with the excellent iCUE software, seeing as its comprehensive personalization features are virtually unrivaled by the competition. Unlike other gaming keyboards in the $100 range, the Corsair Strafe RGB MK.2 is furnished with a full array of multimedia controls including a mute button, a dedicated volume roller, and a whole row of keys for pausing, skipping and going back a track when listening to music. What's more, USB pass-through makes it possible to plug your mouse, headset, controller or anything else you want into the keyboard directly. A soft-touch palm rest keeps your hands comfy all the while. So if you're ready to embrace the blinding illumination of 16.8 million colors at your fingertips, this is certainly a deal you can take advantage of right now. And with the biggest shopping holidays of the year having recently passed, it may be one of the better deals you'll encounter in the foreseeable future.